In an emotional and personal, and at times frank appeal, Hersman, former chairman of the National Transportation Safety Board, said the industry should more closely examine the “human, machine and environmental” factors involved in commercial vehicle crashes. However, the past two years the fatality rate has increased more than the vehicle miles traveled has increased, she said. 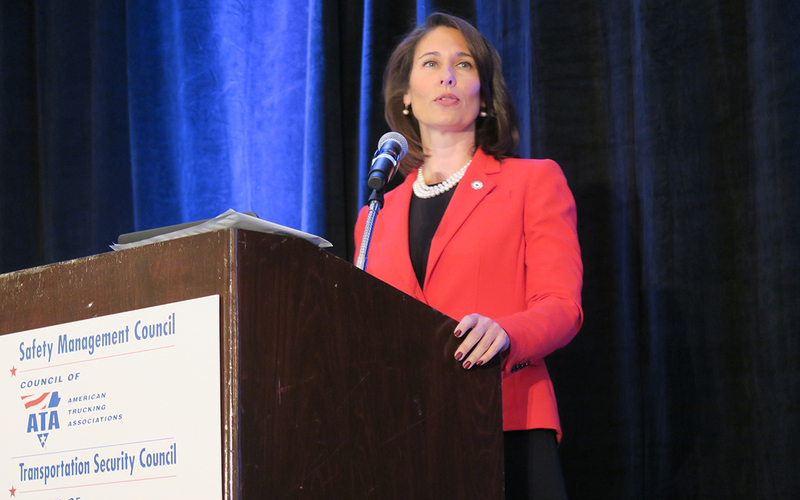 Hersman spoke at the Nov. 14 opening session of a national safety and security conference sponsored by American Trucking Associations’ Safety Management Council and Transportation Security Council. Hersman used a 2015 crash in Chattanooga that killed six people to illustrate her concerns. “At the time of the crash, the truck driver was traveling at about 80 miles an hour, which was 25 miles over the limit,” she said. It was the second crash the driver was involved in only a few days, Hersman said, and came only five weeks after he took a drug test that showed he had amphetamines in his system, and on the day of the crash had spent 14 hours on the job. She challenged trucking executives to make sure their drivers were getting enough sleep, and those with fatigue symptoms to get tested and treated for sleep apnea, a major contributor to fatigue and poor highway performance among car and truck drivers. Hersman also expressed the need for trucking companies to keep close watch on the dangers of opioid drugs, the so-called “Cadillac of pain treatment,” which are increasingly being prescribed for pain and have turned into a national crisis. “My message to you all is to make sure you and your employees don’t start using them in the first place,” Hersman said. She also encouraged the use of safety technologies such as automated braking, blind spot and lane departure warnings. Those three systems alone could save up to 10,000 lives annually, she said. Although there are obvious differences, she noted that the airline industry has had zero crash fatalities some years, while the trucking industry seems to tolerate an average 20% out-of-service rate during roadside inspections. “If we had a 20% out-of-service rate for out-of-service aircraft, how many of you would want to fly if one out of five airplanes had a defect that was so significant they had to be repaired?” Hersman asked. While she was with NTSB, Hersman said there was a constant in those who came to the scene of a fatal crash: They wanted more time with their departed loved ones.